Were the team able to save everyone? 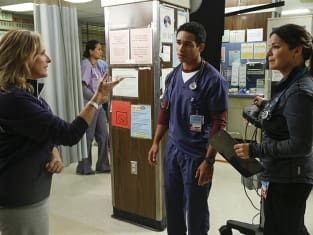 That was a key question on Code Black Season 2 Episode 10 when a patient and her translator were in a car crash that sent their car into the Los Angeles River. On top of that, 13-year-old showed up at the hospital following a seizure caused by spina bifida, but the doctors were shocked to the core when they learned that she was Campbell's daughter. Use the video above to watch Code Black online to get caught up with the latest drama for the staff at the hospital. Loyalty to your friends cannot come before loyalty to your patients. Permalink: Loyalty to your friends cannot come before loyalty to your patients.